Semtech Corporation (Nasdaq: SMTC), a leading supplier of analog and mixed-signal semiconductors, today announced UNIDATA S.p.A, an ICT, telecommunications and internet company, has adopted the LoRaWAN™ technology platform to deploy a low power, wide area network (LPWAN) in Italy. Unidata will also create a showroom, the “LoRa™ Lab,” near Unidata’s headquarters in Rome to educate and encourage Internet of Things (IoT) solutions and services based on Semtech’s LoRa™ technology. Unidata’s LPWAN, based on the standardized LoRaWAN specification, is being deployed initially in Rome and other municipalities in the Lazio region of Italy, which is home to nearly six million people and where it already has extensive fiber optic networks and radio infrastructure. Unidata will roll out additional networks starting in select municipalities in Rome throughout 2016 with plans to cover the entire city by 2017. LoRaWAN is a specification based on Semtech’s LoRa technology that is standardized by the LoRa™ Alliance and widely used in smart metering, smarty city, smart building, agriculture and supply chain management applications throughout the world. Unidata’s LoRa Lab will act as a hub for companies, researchers and others to learn about IoT applications and services and create unique and innovative solutions based on LoRaWAN. 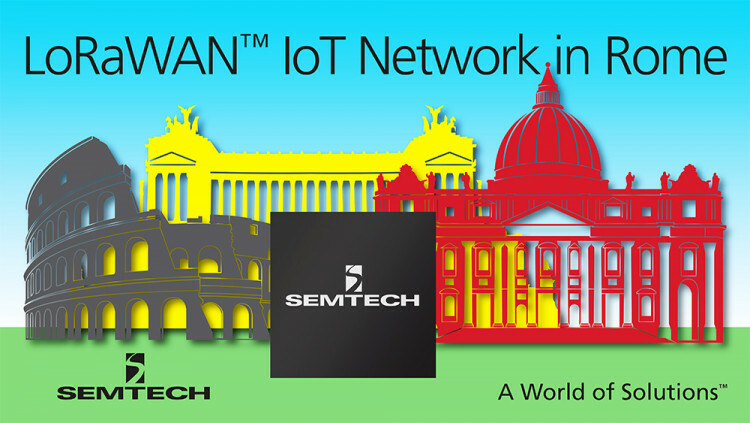 Semtech’s LoRaWAN technology platform is a comprehensive solution for low power, long-range connectivity, which is essential for LPWANs supporting IoT applications. It offers deep penetrability, secure connectivity, long battery lifetime and streamlined implementation for simple network rollout, as well as integration into existing infrastructure. All statements contained herein that are not statements of historical fact, including statements that use the words “will,” “is,” or “offers” or other similar words or expressions, that describe Semtech Corporation’s or its management’s future plans, objectives or goals are “forward-looking statements” and are made pursuant to the Safe-Harbor provisions of the Private Securities Litigation Reform Act of 1995, as amended. Such forward-looking statements involve known and unknown risks, uncertainties and other factors that could cause the actual results of Semtech Corporation to be materially different from the historical results and/or from any future results or outcomes expressed or implied by such forward-looking statements. Such factors are further addressed in Semtech Corporation’s annual and quarterly reports, and in other documents or reports, filed with the Securities and Exchange Commission (www.sec.gov) including, without limitation, information under the captions “Management's Discussion and Analysis of Financial Condition and Results of Operations” and “Risk Factors”. Semtech Corporation assumes no obligation to update any forward-looking statements in order to reflect events or circumstances that may arise after the date of this release, except as required by law.